I thought it was about time I did an update on my Enchantress costume. Things are coming along very well! 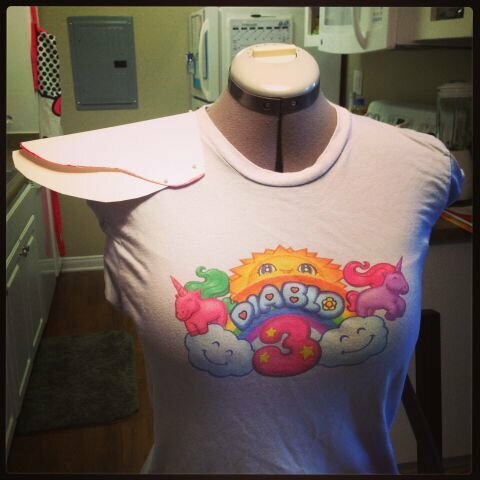 I am so excited to finally be doing a Blizzard costume, and can't wait to wear it to Blizzcon. I started most of my shopping for this costume in January to help spread out the costs. This is probably one of the best things you can do as a cosplayer! Shop ahead, and shop for sales! This has helped me save so much money when buying the material to assemble armor for this costume. There were so many little pieces that had to come together, so it's been nice to work on it in pieces. One of my major purchases was Wonderflex and Worba, which I purchased here. This site also has a bunch of other great cosplay materials, but I found it has the best deals on the thermoplastics as well. If you're making a lot of armor (like I am) it's better to buy in bulk, because you can get a discount. I also went in on an order with a friend which helped pay for the shipping costs, too. Look at all of those materials! I also picked up a pattern, and fabric earlier in the process, but haven't done the sewing yet. I'm hoping to get all of the armor and accessories done, then sew the dress, and then do all of the attachments. Because I hadn't worked with the thermoplastics before, I wanted to start with a smaller piece that encorporated layers so I could get used to the material and squeeze in a bit of practice before doing something larger (like the breastplate). Once I had a good reference to work with, I started sketching out the armor and breaking down the different pieces. Having a bit of an art background for this part really helped me visualize how to actually construct the piece. I started with the shoulders, since they had some challenges, but for the most part, where very straight forward. I decided to do them in three pieces, layered on top of one another, and then add the color piece. I drew the pattern onto poster board, and adjusted it constantly with scissors and holding it up to myself to make sure it was the size I wanted. Poster board patterns pinned up! After getting the patterns complete, I took them to the real materials. I began by placing the pattern on foam, and then cutting it out. I do this for all of the major pieces that I'm making - including all three layers of the shoulders. This gives strength to the material/armor, and more thickness which creates a more realistic look. Now that we have our foam ready, I head over to the Wonderflex. For the armor pieces that might see the most wear and tear, I chose Wonderflex over Worbla. It's slightly tougher, and can take the hits more easily. So for the shoulders (watch out for all of those con-goers! ), Wonderflex was the way to go. I laid the foam piece down, and cut out the wonderflex around it, leaving at least a 1-2 inch space around the foam to help seal the wonderflex. I then flipped the foam piece over, and cut out a second piece with the same 1-2 radius around the foam. With your Wonderflex and foam sandwich, you can began assembly! I normally line up all of my pieces and double check that I didn't mess up anything. Then, I heat up the bottom layer (shiny side down, with the rough-threaded side facing up), very slowly. I always have my heat gun on the lowest setting. This ensures the plastic doesn't burn, and gets just warm enough to fuse, but isn't too sticky or malleable. If you get it too warm, it loses its shape entirely, and becomes like clay (which can be good, depending on what you're doing). In this case, I still wanted it to be moderately flat. After the bottom layer is warm, I place the foam piece on top of that, pressing down to make sure it's stuck on there a bit (Protip: be careful when pressing on warm thermoplastic against whatever table/surface you're using - if it's hot, it's likely to stick! So try to pull it up off of the table every once and a while - I usually work with a special surface in between to keep my table safe). Then, I heat up the second piece and lay it down on top, making sure there is a good 1 inch seal around the whole piece. Phew, that was a lot of work! Now for the fun part. Once the Wonderflex is warm, but not too warm, I begin pressing down around the edges of the foam to seal the two pieces together. This will be hot on your fingers, but keep 'em moving! I tried using gloves at first, but they often stuck to the warm plastic, and ended up being too cumbersome. But if you work with your Wonderflex at a moderately warm (not hot) temperature, it should be safe to handle (should, being the key word). When in doubt, be safe! Wear gloves if you are fining the material is too hot. In the above picture, you can see three of my shoulder pieces completely sandwiched. Once they cool, I use my scissors and trim around the edges, getting about 1/4-1/2 inch away from the foam. We'll be heating them up again later, and can turn under the edges to give it a smoother look if necessary. After I have all of my pieces ready, I begin assembling. Usually I try to shape the pieces first, by warming them and using a model (myself, or styrofoam balls, or the dress form, etc) to let the Wonderflex cool and hold its shape. The shaped pieces can then be put together - that's easy! Heating up the areas you're looking to combine will help seal the Wonderflex. It sticks to itself very well (and I mean very well, be careful) and will hold very solidly once cool. If you make a mistake and want to move pieces, just heat them up again and pull apart! You may notice a bit of bumps/stretches in the material, but those are easily covered or sanded. The shoulder pieces coming together! Even after I put my pieces together, I went back in and did some editing. I didn't like how far the bottom layer stuck out, so I trimmed it, heated up the Wonderflex, and resealed over the foam. The material is really nice to work with, it just takes some patience. After I finished the base of the shoulder, I added the collar, and some trim, and they were ready to go! Shoulders are ready to be primed and painted. Saran wrap + Tape + Scissors = Perfect Pattern! Having a pattern made the process a lot easier. I knew it was exactly the right size, and meant I wouldn't waste any materials. It's like they always say: Measure twice, cut once. Using the pattern to cut out foam. With the pattern, I laid it out on the foam and Wonderflex for cutting. I left the design on the pattern to reference later. I also knew this piece would be layered - so I cut the bottom piece first, so I could cut the top pieces out of the pattern for use later. The sandwich bracers are cut, heated, and molded to size. I still haven't found the best way to hold the Wonderflex while it cools - for now, I've mostly been using tape or household objects to keep things in place, but this doesn't feel like the best setup - although the alternative at the moment is to sit there and hold them (I'd rather spend my time working). While the base is cooling, I got started on the upper layers and detailing for the gloves. I cut out a pattern with the poster board, and cut that into wonderflex. I cut two for each arm (so 4 total), and then heated the two layers together to give it an extra thickness (I didn't think foam was really necessary). This created a great lift for me to highlight in the painting process later. I then continued to add details until the gloves were complete! Hand pattern for the glove. Recently I started working on the hip armor. I've tried to kind of work my way from the top down - working with the smaller pieces to get better and better with the material, and advancing to the larger, more complicated pieces. This weekend I was able to finish the base of the hip armor, and will be adding more details later. I'll need to shape it to the right size but the bulk of the work is done. Thanks for reading everyone! I know it was a long post. I hope some of the explanations and tips were helpful. I can't wait to put everything on for a test run and show some more! Once I finish the hip pieces, I'll be starting either the breast plate or the leg armor!